Home / College/Community Split / At-Large Bids: What Went Wrong? At-Large Bids: What Went Wrong? 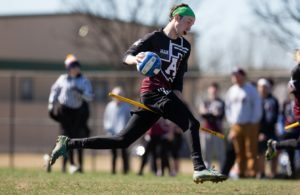 Earlier this month, 16 collegiate at-large bids were distributed, providing us with the full ledger of teams attending US Quidditch Cup 11. The 16th at-large bid, however, fell all the way to #110 Tulane University, bypassing 12 teams who were otherwise ineligible or did not apply for an at-large bid. 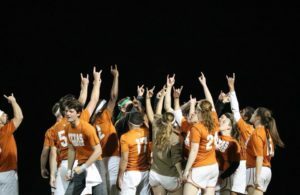 The at-large bid system was announced in August of last year as a means of giving a bid to the 16 highest-ranked college teams who did not qualify at a regional championship. The final bid dropping to the 28th-ranked non-qualifier begs the question: What went wrong? We spoke with a representative from each of the 12 deferring teams to give us a better picture of what occurred. Those teams were Clark University; College of Charleston; Florida Gulf Coast University; New York University’s B-Team, the New York Pigeons; Ohio State; Skidmore College; SFA University, otherwise known as Lumberjack Quidditch; Stockton University; University of Pittsburgh; University of South Carolina; University of Tennessee Knoxville; and VCU. Of the 12, one was eligible for the at-large bid requirements but did not apply, ten were ineligible due to not fulfilling the game requirement and one was ineligible due to not attending a regional championship. Of the teams interviewed, eight listed lack of funds as a reason for not being able to attend (three as their primary reason, five as a secondary reason). 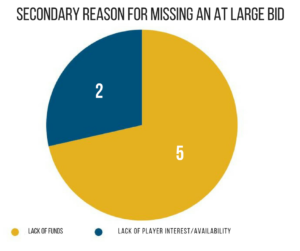 Seven teams listed lack of player interest or availability (five as their primary reason, two as a secondary reason). Two listed unawareness of their eligibility (both as their primary reason), and two listed their inability to fulfill requirements (both as their primary reason). For many teams, a combination of all these factors came into play and, in many cases, reinforced one another. For example, after a regional, a team would not be fully aware of whether they would be in the running for an at-large bid. This would reduce motivation and turnout at club events through the rest of the season, and create a lack of impetus to fundraise. 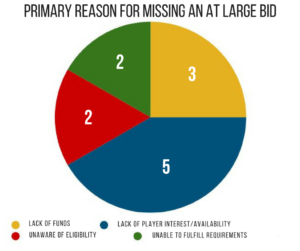 Finally, when the at-large bid picture became clear in early March, many teams felt it was too late to re-motivate players and fundraise extensively for an expensive trip. This was especially pronounced for the seven teams on this list who had fall regionals, many of whom mentioned that their teams often had diminished activity in the spring, either due to weather or the momentum of team culture from seasons past. Several teams expressed the desire that a running ranking of teams eligible for at-large bids was posted somewhere official. While USQ’s standings did have this information, the mixture of club and college teams in the standings–and the fact that the list was unclear on which teams had already received bids to Nationals–made parsing this information difficult. 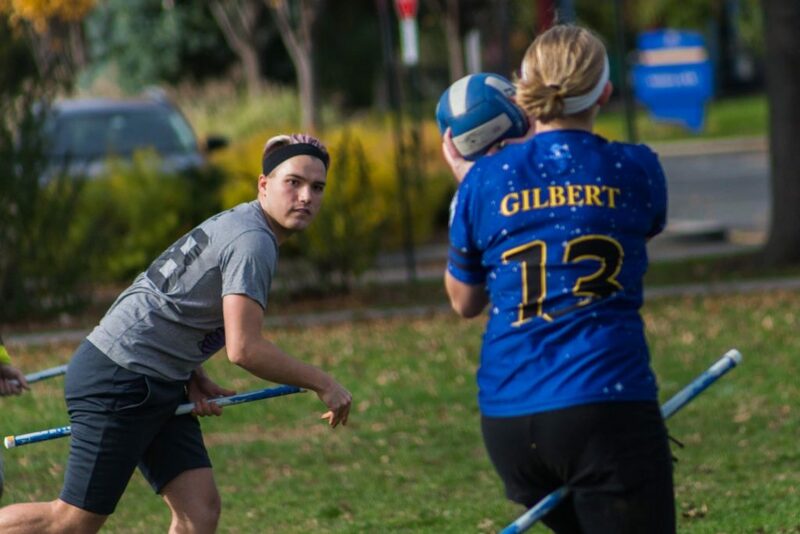 Quidstats, a third-party site created by Michael Li of the BosNYan Bearsharks, did have this information in a more digestible form; however, the site was only spread on quidditch social media and was never officially mentioned or promoted to teams by USQ. 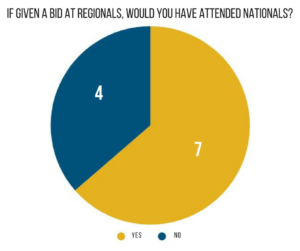 The delayed timeline of the at-large bid process was also a factor, as highlighted by the fact that, when asked, seven out of 11 teams who attended a regional confirmed that they would have likely attended Nationals if they had received a bid at their regional. Additionally, many teams expressed wishes that the at-large bid system existed within a longer timeline–granting them more forewarning to prepare. Hindsight being 20/20, it appears that many teams, both on and off this list of 12, were caught off-guard by the new format for Nationals bids and qualifications. In previous seasons, a team knew with certainty after their regional whether they were going to USQ Cup. Despite the change in bid distribution this year, it seems like the momentum of that mindset carried over; many teams initially felt that their season was over after their regional, even those which did end up ultimately applying for an at-large bid. Furthermore, the one-year jump from 39* to 64 college teams featured at Nationals meant at least 25 college teams who were not in the running last year were eligible for bids this season. That put into consideration multiple teams that have been perennially out of the running. While many teams were prepared for the new paradigm, this single-year explosion caught some unprepared. 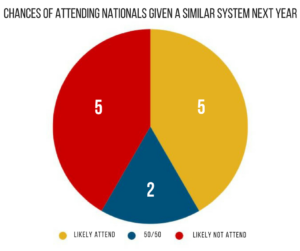 When asked to consider their chances of attending Nationals given a similar system next season–and what they learned this year–five of the teams I interviewed said they would likely attend, two were unsure and five said they likely would not. The five that said they would not attend primarily listed uncertainty that they’d be able to fundraise enough and carry a large enough roster given the extensive travel. With all these facts in mind, what could have been done better? It’s unlikely that any one fix could have served as a panacea for attendance, but, looking forward, a couple solutions stand out. Firstly, the bid process timeline could be reevaluated. Within our current system, it would be hard to make the at-large bid announcement date any earlier than it already is without giving a massive disadvantage to areas with late regional championships. However, if the number of at-large bids was reduced to eight, and eight more bids were distributed at regionals, it is very likely that the teams who received those bids at their regionals would have been able to attend nationals, giving the tournament a stronger pool of teams. Furthermore, should the at-large bid system continue in the future, the current convoluted system of determining which teams were in the running for at-large bids would need to be improved. It would be both helpful and prudent for USQ to either provide a clearer tracking of which teams are in the running for at-large bids or to partner with Quidstats in an official capacity. Lastly, an equal part of the adjustments moving forward need to be taken up by individual teams. 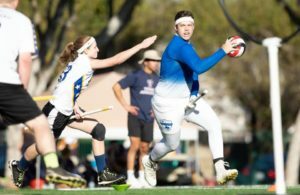 With an expanded Nationals, and the availability of Consolation Cup**, every team should sit down and decide early in their season whether they plan to compete at a national tournament, as the opportunity will be there for most teams that wish to take it. If they do decide to do so, a season-long effort should be put into fundraising and motivating the team to be able to attend those events. This is something squads can take upon themselves, but something that can also be bolstered by efforts from community members such as those with specific experience in what works in fundraising or USQ Regional Coordinators. As team motivation seems to be dropping while the number of opportunities to play keep expanding, regional coordinators can be key volunteers in the efforts to help fight this. At the beginning of next season, regional coordinators should poll captains/coaches in their regions to see which teams intend to attend a national event and make sure those teams are aware of the actions necessary to achieve that goal. Just having someone ask that question may lead a team to realize that it has that opportunity. Should the regional coordinators poll show that the interest isn’t there, it would be a valuable yardstick for USQ to use in determining the size of Nationals. With 12 college programs deferring at-large bids this year, it’s clear that 64 teams was too many. Whether that will change next season as the community adapts to the new system, only time–and proper planning–will tell. *USQ Cup 10 featured 60 teams: 39 college and 21 club. ** This year’s Consolation Cup was cancelled due to a lack of interest by teams–which arose in part due to the expansion of Nationals–but was further compounded by the lack of eligible teams who were unwilling or unprepared to travel. Next Story → Tulane is Going to Nationals, and Should You be Pissed About It?